When searching for the hard-to-find molecule, gaining insights and expertise from the DMPK community is critical. Browse these resources to be even more effective in quantifying small molecules for drug efficacy. This white paper describes a suggested approach to developing methods for use with the ionKey/MS System. The instrumentation may consist of the ACQUITY UPLC M-Class System, and any Xevo/SYNAPT Mass Spectrometer that can be fitted with an ionKey source. This poster was presented at the 2018 ASMS annual conference from June 3-7 in San Diego, CA. Originally launched in response to the need for robust, high sensitivity microflow LC/MS applications, the integrated microfluidic tile-based ionKey/MS™ platform continues to evolve as a system that can be implemented for routine applications. ionKey/MS™ has quickly gained traction in new application spaces yielding a more functional and flexible system. These new areas include quantification of intact and digested monoclonal antibodies, thyroglobulin, opioids in oral fluid, estradiol, and steroids. You’ve heard a lot about microflow LC/MS. Are you cautious about making the switch? Do you still have questions or concerns about method development? We are going to use this time to review the top 10 misconceptions and challenges that we have heard and observed. Our hope is that after you have listened to this presentation, you will be able to make an informed decision on how microflow LC/MS will fit into your workflow. This poster presented at 65th ASMS Conference from June 4-8 in Indianapolis, IN. This poster presented at 12th Annual Great Lakes DMDG meeting from May 4-5th in Michigan. The following is a compendium of microflow LC-MS-based peer reviewed journal articles using Waters® ionKey/MS™ System. Each article is authored by leading researchers and/or Waters’ scientists. They cover many analytes of interest including small and large molecule therapeutics, biomarkers, supplements, and food. The sensitivity gains observed when using microflow LC-MS do not always translate into an everyday workflow advantage in a high throughput laboratory. 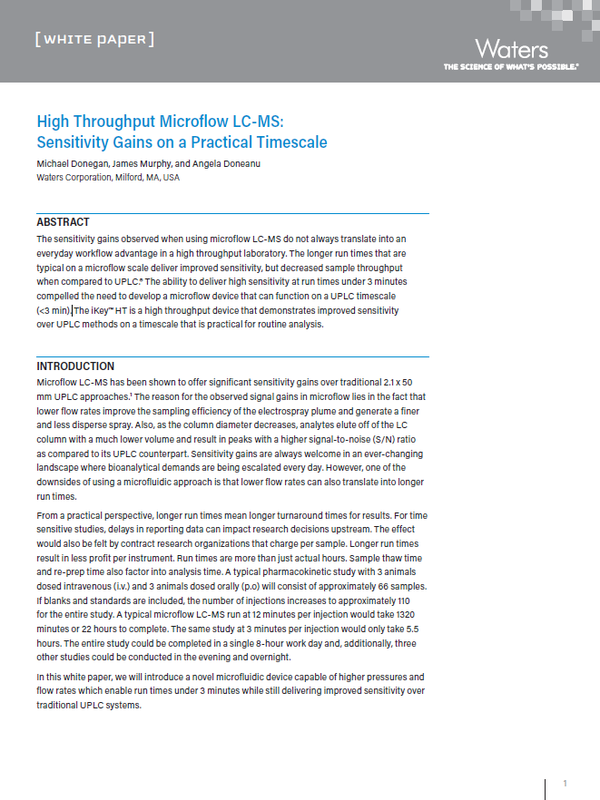 The longer run times that are typical on a microflow scale deliver improved sensitivity, but decreased sample throughput when compared to UPLC. The ability to deliver high sensitivity at run times under 3 minutes compelled the need to develop a microflow device that can function on a UPLC timescale (<3 min). This white paper introduces a novel microfluidic device capable of higher pressures and flow rates which enable run times under 3 minutes while still delivering improved sensitivity over traditional UPLC systems. 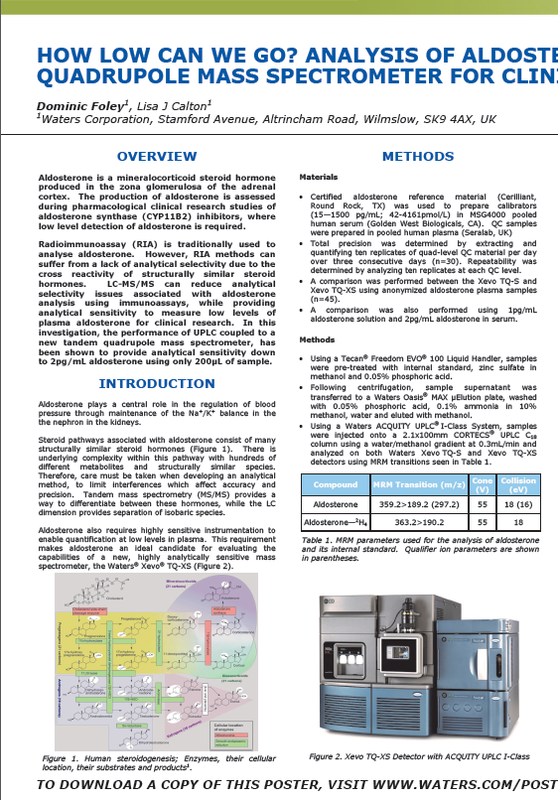 Presented at ASMS 2016, this poster demonstrates that the performance of UPLC coupled to a newly-developed tandem quadrupole MS has been shown to provide quantification down to 2 pg/mL aldosterone using only 200 µL of a serum sample.